Growth comes in many forms. Sometimes I consider getting a load of laundry complete as a victory, which leads to growth in some fashion! Anytime we can get a check in the ‘WIN’ column, is growth. Ok, well, a couple of those listed above need some work still, but growth is good. Anytime we can make a tiny bit of progress is one less day we have to sit around thinking about what we need/should/ought to be doing. So take it from me, the guy who hasn’t written anything on this blog in over a year…get something started, don’t worry about when that something will be finished, or if it will ever get finished, just start it. Baby steps, baby! Let me know what you plan on starting, and how you plan on going about doing it! Now I know that Yes, babies need to be entertained! As Griffin grows, his interests and his abilities change nearly every day. Each day he looks at something differently, his motor skills are developing, and what he finds boring alters. 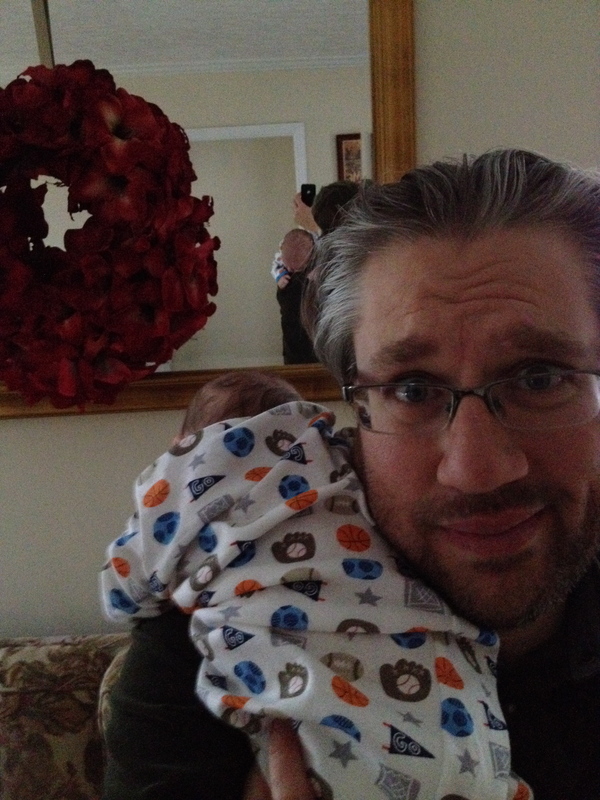 Some days simply making funny faces with funny voices will make him laugh (as much as a 4 month old can laugh). The next day, those faces/voices elicit blank stares. A favorite crinkly toy Lion is the best thing ever on Tuesday. By Thursday, he won’t touch it, only to turn around on Saturday and love the Lion once again! I have learned to keep a plethora of items around and ‘activities’ ready to go so The Boy can thoroughly enjoy his day. 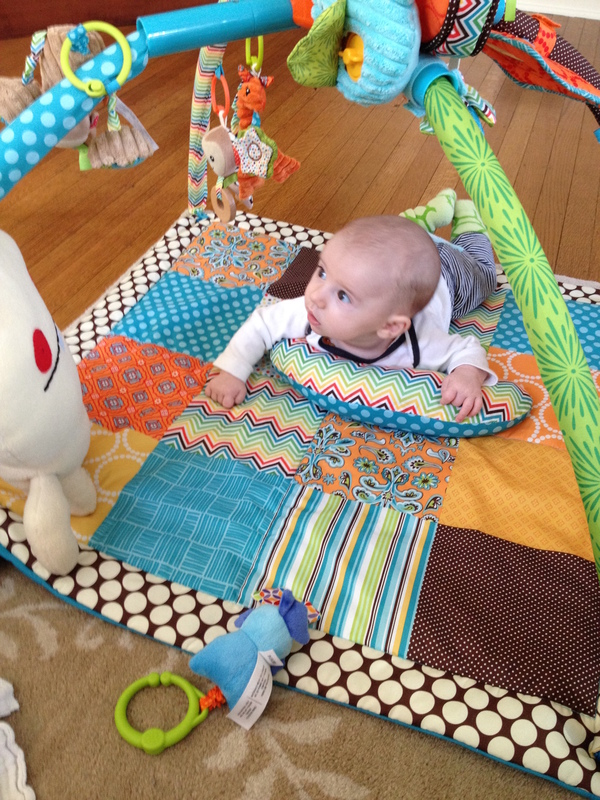 The entertaining play mat! The Boy demonstrating Belly Time! – The play-mat. I can put him on this mat on his back and he can reach for the plush animals dangling above him. He can kick his feet and even do a very slow ‘Curly-Shuffle’. – Having him ‘stand’ on my lap, while I’m holding him up, and shifting him gently back and forth while singing the ‘Griffin moves back & forth and up & down and near & far’ song while he laughs and drools everywhere! – READ BOOKS! There are certain books he really enjoys looking at. Anything colorful with lots of contrasts he’ll enjoy. He’s starting to grab the pages and ‘help’ me turn the pages too! – Reading to him. Sometimes I’ll read to him news articles, the current book I’m reading, or St. Louis Cardinal articles. He likes watching my lips move. It’s pretty cool! – Dancing to records. After engaging his brain and body in activities he starts getting tired so on goes the record! 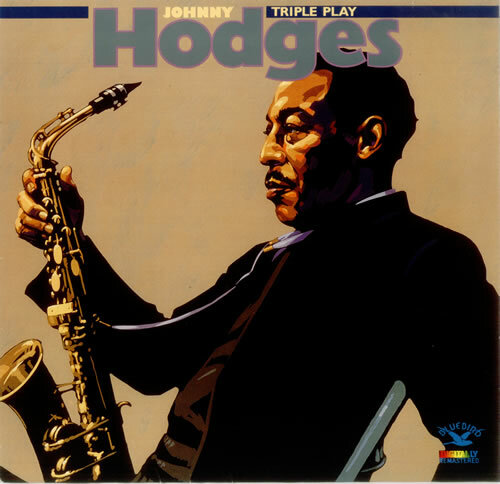 Currently, he’s digging the Johnny Hodges album, Triple Play. By about the third tune, he’s fast asleep and off to bed with him! At this point in the morning, I can maybe shower, do some laundry, read something, watch some TV, or nap with him! When he wakes up, the process starts all over again. 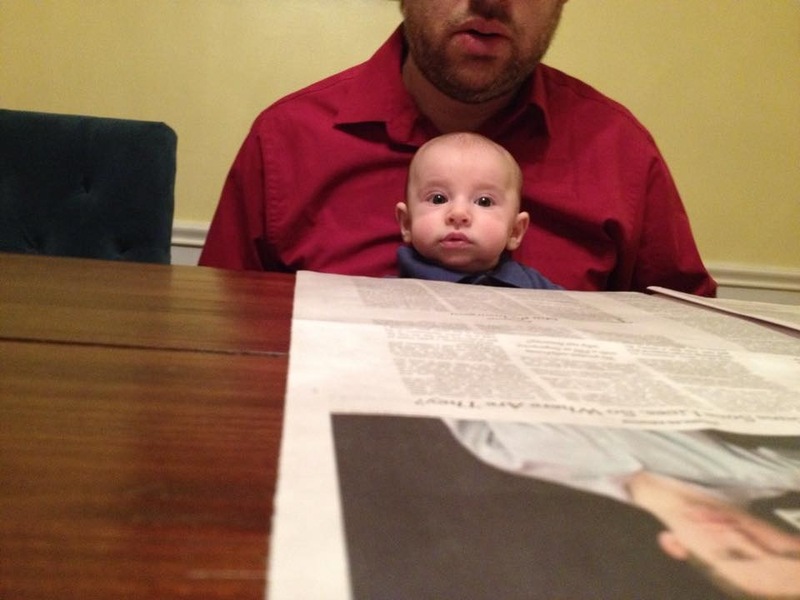 What have been successful activities you’ve used to entertain a baby? Reading, Reading, Ready, and READ!! I’ve been reading a lot lately. I admit it and I’m okay with it. After receiving so many great book suggestions, it became apparent that I have some very intelligent friends! Who knew?!! Sometimes I like reading for the sake of reading. It’s an escape. Some of the things that I read are not very challenging or very difficult. BUT, when I start on an Isaac Asimov, Simon Green, Ian Banks or any other similar books, I can’t put it down. I just can’t! 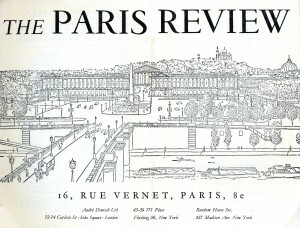 However, I have to POWER through some short stories in The Paris Review (TPR). I recently finished a nearly 300 page novel (broken into 4 segments and published over a year in TPR) by Robert Bolano. When I was finished, I only could ask myself, ‘Why did I put myself through this?’ I just didn’t enjoy it. Am I so bad? 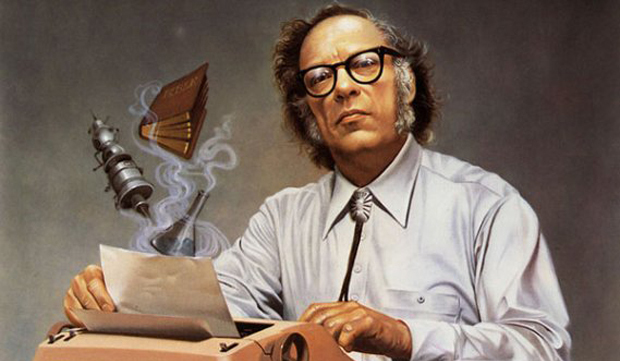 My reading goals this year are to read the Isaac Asimov ‘Foundation’ series (starting with the Empire Novels), then each month I will read an entire issue of TPR. I’m 12 issues (3 years!!) behind, so at the end of the year, I’ll be caught up, except for the 4 issues I’ll get this year…so I’ll be a year behind. Oh well. Stick around and find out my relationship with The Paris Review and how I deal with those periodicals! (very dramatic ending to a blog post, huh?!) In the meantime, what are you reading? Anything I just HAVE to check out? Do you read just for fun, as an escape, or do you look for challenging reads? Does a challenging read equal a larger reward? Let me know! 1. Figure out how to SELL and WORK the great duo Elevator Up! – I love this band. We are funny, hard working, funny, and interestingly funny. Some people get us and love us, some people just look at us and shake their heads. We get ourselves and we love ourselves and we need a place to play and I’m going to do my best to find a venue for us to unleash our insanity! 2. Get X working with Y to ultimately replace Z. – no names need be named, but something needs to change, and soon. – Hey, have you heard that I have a radio show? Yeah, I do. It airs every Saturday night at 8pm on WICR, 88.7fm, or it can be streamed: http://www.wicronline.org, or through the iHeartRadio, TuneIn Radio apps. We also have a Soundcloud account. I co-host this show with non-other than Matthew Altizer. He’s a long time friend and great radio partner. I hope you can tune in. I would love to get this show some MONEY. Maybe syndicated, sold, I don’t know what, but it’s time it took off. What we do sounds great and needs to be heard by a wider audience! Are you with me?!!! – I need to move my baby grand piano into my new house! Currently it is residing in my old place, and my previous housemate is practicing on it quite a bit, so the piano is getting some good use. I however need to get it here so I can start working on my piano chops. Having a piano in the house will help me work on arrangements, compositions and everything in between! Maybe it’s best to wait to tackle this until the temperature stops hovering around 0 degrees Fahrenheit. Whether or not I tackle everything on this list, as least I have something to think about and goals for the new year. Any resolutions for you? Do you separate professional and personal resolutions, or are they all rolled up into one big resolution list? Baby is happy and we had a lot of fun finding our toes, dancing to Duke Ellington and Johnny Hodges, and playing with a crinkly lion toy. 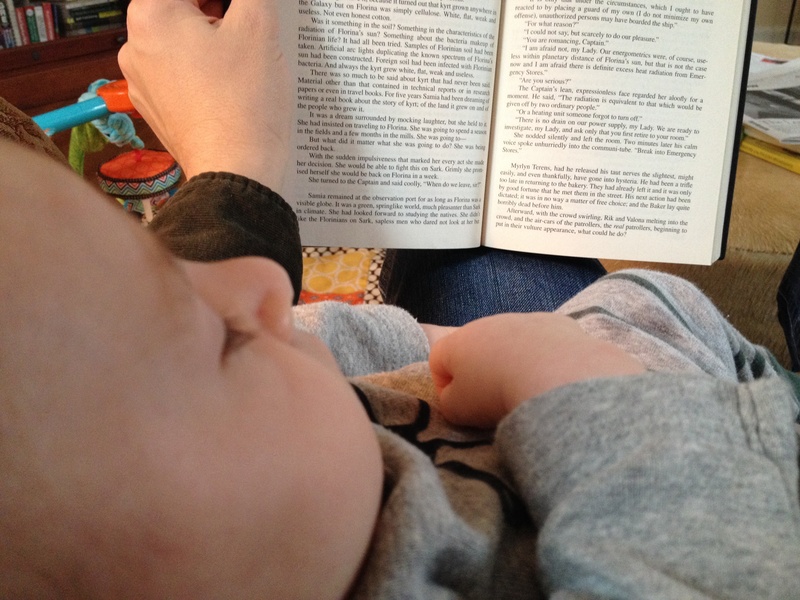 I read the majority of the Isaac Asimov novel ‘Currents of Space’ to the little guy, and I think he enjoyed it! What are your tips and tricks for getting an infant to sleep? I wanna know! Our little boy, Griffin, is about the cutest and funniest thing I have ever encountered! Before he was born in October, I had visualized what a day at home with a baby would be like. I would play with him, read to him out loud, dance around with him while listening to great music, listen to NPR to become wordly, then feed him. He’d fall asleep for a while and I would be able to get any number of things accomplished around the house. Maybe I could practice, make dinner, do laundry, arrange some music, write letters, read books and newspapers, or just be generally productive while he is sleeping. The position is currently trending and popular! Two months into his life, I have lost all expectations of getting ANYTHING accomplished during the day! At least there are plenty of meals made and ready to go in the refrigerator and freezer and we’re caught up on laundry! Starting from square one and hopefully ending on square one week after week! Check back for all the fun details of the adventures of Dad and Griffin! Any suggestions on entertaining a 10 week old? I’ll take ’em! I’ve recently gotten back into the running life, and so far I am enjoying it. What I am NOT enjoying is the sub-freezing temperatures, snow, sleet and wind. That damn wind can pierce anything! – Catalogue all aches and pains. – Move attention away from aches and pains knowing they will cease once I get in a good rhythm. – Concentrate on a nice pace. – Plan route a few turns in advance, nothing too far ahead, I want my mood to take me where I need to go. – Wow, now I’m home and DAMN I’M COLD!!! I’m sure as I increase my distances I’ll let my thoughts wander and I’ll wonder about various things, but I doubt I’ll start listening to music, or radio shows, or anything else. I like the comfort of my solitude out there on the road. How do YOU entertain yourself while running, or working out?